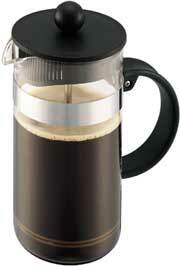 What is a French Press (Press Pot)? This refers to a device that makes this type of coffee. Also known as a Press Pot or Plunger Pot. There are many manufacturers and the pots are readily available. Using this method will give you an excellent cup of coffee and your friends will be amused watching you prepare and brew the coffee right at your dinner table! A French Press (duh) and a heat source, coffee, water, and optionally sugar. What type of coffee grind? The French Press uses a medium to coarse grind. The grind must be large enough so that the mesh filter works and does not get clogged. Because of the larger grind, the brewing time is a bit longer than with other methods. A grind set between drip and percolator is a good place to start. Water temperature is vital. Doing it correctly, you can make what many say is the perfect cup of coffee. Ideally, you want the temperature between 195 and 200 degrees F. One way to do this is to boil the water and use an “instant read” thermometer from any kitchen store. Once you remove the water from the heat, see how long it takes to reach 200 degrees. It will probably be just 10 or 15 seconds. In some places, your water may boil at the proper temperature (higher elevations). Do not allow the water to boil more than a couple of seconds. Once you know the timing, you are all set for the future. Remove the lid and plunger. Use two rounded tablespoons of coffee for each eight oz. of water. Note that coffee cups range from five to eight ounces. My press holds 32 oz. of water, that goes up to the bottom of the silver band. I use five rounded coffee scoops. Put the dry coffee into the clean pot. Using the proper temperature water, start slowly adding it to the pot. Most of the coffee will float. You can briefly, gently stir the water at this point and many grinds will sink. The screen should be up against the bottom of the lid. Place the lid on the press. Many lids have a position that does not allow steam to escape, use this position if you have it. After one minute, if you did not stir in Step 2, you can remove the lid, give a brief stir, and replace the lid. Now this time depends on your grind so you will need to practice. Timing from the addition of the water, after a total of THREE to FIVE minutes you will need to start the plunge. The finer a grind you use, the shorter the time. I typically brew for five minutes. Hold the lid with one hand and carefully push the plunger down, the screen will push the grinds to the bottom. If the filter screen is tilted and grinds are escaping, just remove it, give a quick rinse, and replunge. It should take about 20 seconds, this is not a fast push, there is resistance and it gets a bit tougher as you go. Pour, add your sugar and cream if you must, and enjoy. Don’t let the coffee sit in the pot, it will actually keep brewing. Also, be aware, there will be some grinds in the bottom of your cup, it is best not to go for the last drop!